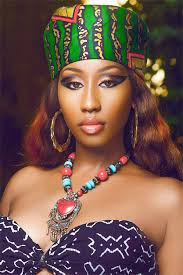 Singer Victoria Kimani has a word of advice for her Kenyan sisters. The Choc city star took to Instagram yesterday September 19, 2016, saying she's tired of young girls in Kenya being pressured by society to become over glorified prostitutes. She wrote, "I want young girls in Kenya NOT to be pressured by society to become over glorified prostitutes... Finish school .... You don't have to be a hoe to be relevant, NEVER trade RESPECT for ATTENTION. I Love you ... I would never lead you astray."